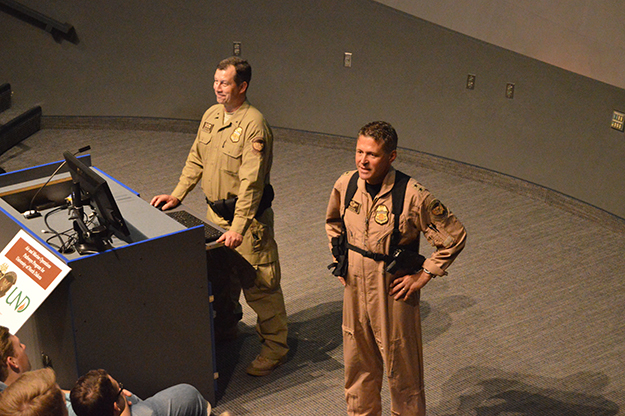 Air and Marine Operations Deputy Director for the Northern Region Christopher Wiyda (left) and AMO Executive Director of Operations Dennis Michelini (right) address students gathered in the Arthur P. Anderson Atmospherium on Tuesday. Dennis Michelini, executive director of operations for the Air and Marine branch of the U.S. Customs and Border Protection (CBP), was blown away this week by the number of students wanting to learn about his organization’s newest endeavor with the UND Aerospace. Announced by U.S. Sen. John Hoeven, R-N.D., an instrumental proponent of the partnership, the Pathways Program selects sophomore and junior pilots to be hired as CBP trainees. UND Aerospace has had previous flight-training relationships with CBP and the U.S. Army. The Pathways Program provides training exclusively to students attending UND Aerospace. With Michelini was Christopher Wiyda, deputy director overseeing recruitment for the CBP’s northern region; and Becky Brouillard, a supervisory human resources specialist for CBP in the Twin Cities. The program could serve as an alternative recruitment source to fill vacant positions for pilots. By the middle of November, CBP hopes to have 16 UND sophomores and juniors selected. The training involves working with CBP’s National Air Security Operations Center in Grand Forks. Selected students must complete 640 work hours before moving on to an official role. Responsibilities include assistance in developing operational plans for interdiction missions, interfacing with local law enforcement and performing security liaison duties. With respect to other organizations within the U.S. Department of Homeland Security, AMO has a small footprint. It employs 1,826 personnel — including 300 marine agents, patrolling the waters, and 700 pilots. AMO has more than 240 aircraft, manned and unmanned, and 300 marine vessels comprising a sophisticated network in 74 operating locations. 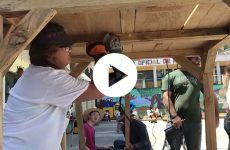 “Groups kind of like working with you because you can give them capabilities they never had,” Michelini said. Such capabilities include a wide variety of rotary, fixed-wing, multi-engine and unmanned aircraft equipped with the latest and greatest in sensors and imaging technology. AMO’s primary concern is monitoring and protecting the nation’s borders from potentially dangerous activity, terrorism and the illegal drug trade. 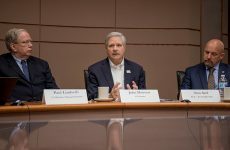 When the Pathways Program was conceived little more than a month ago, between AMO Acting Executive Assistant Commissioner Edward E. Young and UND Aerospace Dean Paul Lindseth, the focus was on recruitment. That’s because about 35 percent of AMO’s pilot workforce will be eligible or mandatory for retirement in the next six years. Recruiting for a federal job can be challenging in a competitive environment like aerospace. Michelini and Wiyda presented potential benefits of engaging in the Pathways Program and eventually becoming an agent with AMO. Wiyda highlighted 401k contributions and discounts for health insurance as factors that close the gap of any pay discrepancies with the commercial industry. 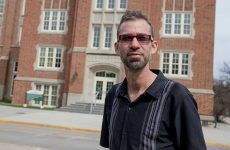 Also, after graduating and accruing 1,000 flight hours, he added, Pathway Program participants can earn $104,000 annually after two years. “The sky’s the limit in our organization, from my experience, if you come in with a good attitude and a good work ethic,” Wiyda said. “If you want to expand, promote, grow — the opportunity’s going to be there.